Government has used public health policy in many different arenas to improve health outcomes and protect the public’s health. Many of these policy interventions—such as air bag and seat belt requirements for automobiles, vaccination requirements, and the prohibition and restriction of tobacco products—have been extremely successful. A comprehensive framework of tobacco policies in Hawaii led to a 65 percent decrease in smoking rates among high school students from 2000 to 2011. 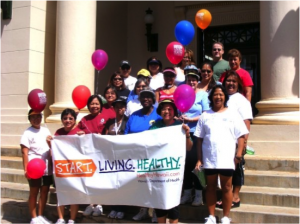 A similar framework to encourage physical activity and healthy eating will contribute to changing social norms and creating environments where the healthy choices are the easiest choices for Hawaii residents. HHI utilizes a comprehensive approach to address obesity, as recommended by national organizations including the Centers for Disease Control and Prevention and the Institute of Medicine (IOM). IOMs recommendations are delineated in a report called Accelerating Progress in Obesity Prevention: Solving the Weight of the Nation. HHI bases its policy work on the recommendations identified in this report. HHI led the charge in the development of a Nutrition Wellness Policy for the Department of Health. In April 2015, the Department adopted the policy requiring meetings, training sessions, workshops, conferences, and other events to offer healthy food and drink options if the event is sponsored with state or federal funds. The new policy is designed to promote a healthier work environment, giving employees, partners and meeting participants the opportunity to choose from healthy options. This is one of many initiatives that HHI is undertaking to encourage healthier work environments. HHI and Department of Health leadership hope to inspire other state agencies and private sector employers to adopt similar standards for their meetings and conferences, to put the state on a positive path to better health. To address the urgent need to reverse current obesity trends, Governor Abercrombie signed Senate Bill 2778 into law on July 6, 2012, creating the Childhood Obesity Prevention Task Force. Act 269 charged leaders from government, education, healthcare and business sectors to develop policy recommendations and proposed legislation around obesity prevention. The task force ultimately identified eleven recommendations for the 2013 legislative session and one recommendation for the 2014 legislative session. When implemented together, these recommendations could reshape Hawaii’s school, work, community, and health care environments, making healthier lifestyles obtainable for all Hawaii residents. The Childhood Obesity Prevention Taskforce Report (PDF) describes the recommendations of the taskforce. HHI has worked with partners to successfully see the passage of several important policies that help improve physical activity and nutrition, namely Complete Streets and Safe Routes to School legislations. See Active Transportation Policies for a description of these State and county level policies. 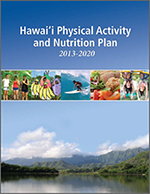 Through a collaboration with the Department of Education, HHI supports the health of Hawaii public school students through the development, implementation, and monitoring of the Wellness Guidelines policy. To learn more about the Wellness Guidelines, see Policies that Support Health in Schools. HHI supports the development of the Nutrition and Physical Activity Coalitions (NPACs) that enable partners to advocate for policy, social, and built environment changes. The Kauai County NPAC and Maui County NPAC have created steering committees and task forces dedicated to topical areas such as the built environment, worksite wellness, schools, and nutrition. Both NPACs have been instrumental in supporting the passage of legislation that improves physical activity and nutrition at the state and county levels. Since 2007, HHI has been holding Physical Activity and Nutrition (PAN) Summits to engage stakeholders across the state in obesity prevention. The Summits are meant to unveil and/or track progress of the current State PAN Plan. For more about our latest PAN summits, please see State PAN Plan (PDF).